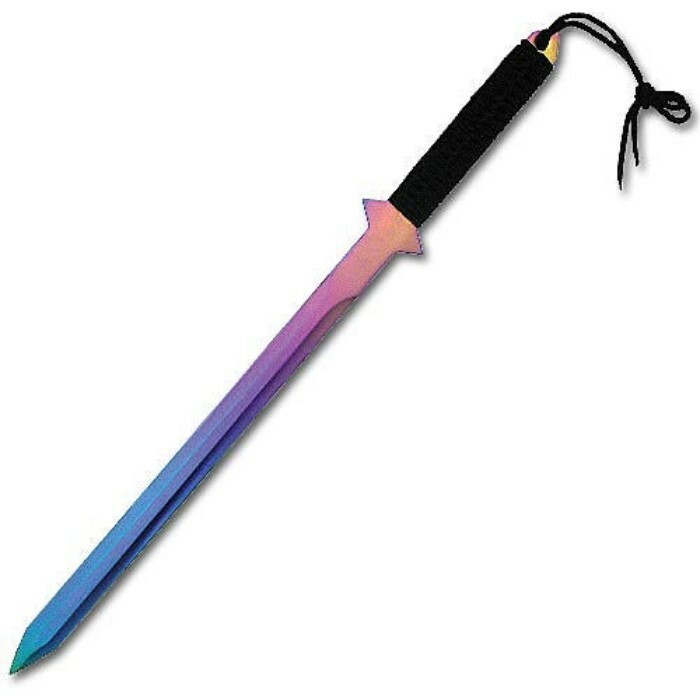 Full Tang Rainbow Sword | BUDK.com - Knives & Swords At The Lowest Prices! This ninjato offers full tang stainless steel construction and a distinctive blade appearance. Measuring 26" overall, this sword features a matte tri-treaded rainbow finish on the blade to give it a look all its own. The handle is nylon cord wrapped and offers a lanyard cord. Includes a black nylon sheath that can be worn over the back. United, XL1146. Great sword. Not very comfy to hold but still very useable. No complaints here. good job. Amazing this is fantastic... trueswords has done wonderful with this supply on this sword it looks amazing feels amazing and razor sharp... VERY RECOMMENDED!!! This thing is pretty sweet. Light, agile, perfect for a ninja. The grip is nice, nice and secure. As for the color, it doesn't really shift around as much as I thought it would, its really just a mix of bright pinks and reds on one side, and blues and purples on the other. Don't get me wrong though, still a beautiful color. (just doesn't really shift around as much as I thought it would) Also, mine came pretty sharp, I actually cut my thumb when feeling it lol oh, and the sheathe is pretty good. Mine came pure pink....LOL. I dont mind tho im just hanging it on my wall. I wouldent suggest trying to use this as a ninja sword.... It almost glows at night. AWESOME SWORD. beautiful looking, shines in the light perfectly. strong blade, and the sheath that comes with it is nice, too! awesome sword. I love this thing! 5 stars for the feel, the look, it was sharpened, and the delivery speed was incredible. Just got my order today. First off, I am very satisfied with the delivery's speed. Secondly, this sword is fantastic! Right out of the box, I loved the feel, the balance, and the colors. And, speaking of the box, I'm very glad to say that the sword made short work of it. This feels to me like the first purchase of many to come from True Swords! Excellent work! One thing I didn't get about the titanium finish was that the color is static. It appears to me from the picture that it is a shine that shifts colors as you turn it, but it is more of a static colored finish like in the picture. As for the sword itself, it is surprisingly cool for a little sword. this is a pretty good short sword, the blade was really titanium, but the only thing i didnt like was that the color of the blade wasnt changing in the sun, i got it for a girl and she LOVED it lol, its a GREAT Gift.